As one becomes an upperclassmen, ice cream scooping, life guarding or being a camp counselor at the overnight camp in upstate New York that they’ve been attending since they were potty-trained starts to look less appealing on a resume for a post-graduate job. This is when advancing into what can be considered the most adult-like summer job a college student can get their hands on comes into play: having an internship. production and media studies majors. Interns are eligible to receive three academic credits for 120 hours of fieldwork.” The brochure also states that students are recommended to intern at the end of their junior year or during their senior year. Quinnipiac offers help and instruction to students through its faculty, such as Assistant Dean of Career Services for the School of Communications, Joseph Catrino. Catrino provides several outlets for School of Communications students to make sure they’re not left in the dark when searching for internships or missing out on any potential networking opportunities to find one. Catrino’s weekly “SoC Update” emails to communications students provides information regarding important upcoming dates for career workshops, events or SoC class openings, time slots to have a resume review session with Catrino himself and information about QU Career Connections; a password protected database for students of all majors, alumni and employers to apply or post job or internship opportunities, to name a few. Senior print journalism major and sports studies minor Jared Baiman benefited from Catrino’s weekly update emails last fall by finding a summer internship at NBC. Baiman said he was able to be a part of some substantial projects for the department within his internship, from finding press clips to writing a pitch and a social media plan for the Diversity Communications Department. The summer time is usually recommended by faculty as a good time for internships. Senior public relations major and marketing minor, Katie Van Leeuwen was an intern in New York City this summer for the small in-house public relations team at ideeli.com, a flash sale website featuring designer clothing and home goods at lower prices. Van Leeuwen said she left her internship feeling reassured that she was on the right path with her major. Unlike Van Leeuwen and Baiman, senior public relations major and sports studies minor Matt Bernstein got lucky with no commute into NYC for an internship at the Office of Public Affairs at Quinnipiac under John Morgan last spring semester. Bernstein was in charge of posting MyQ articles, updating the Quinnipiac calendar for university events, writing press releases, and contributing to Quinnipiac’s Facebook and Twitter pages. “I gained a lot of real world experience and was never asked to do any grunt work,” Bernstein said. Bernstein said he is appreciative for his internship at the Office of Public Affairs, but explained that he wants to broaden his horizons with his public relations studies. Similar to Bernstein’s reflection on his internship, Baiman also stated that the corporate world may not be the best thing for him career-wise because of the intensely fast-paced atmosphere and the lack of direction that was given to him. His internship helped him realize that he wants to focus more on getting into something specific, such as NBC Sports. 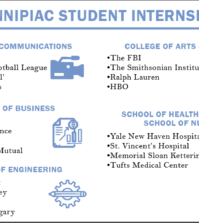 In addition to the positive benefits that an internship provides, Catrino also explained that it’s good to find out what you don’t want to pursue as a job while still at Quinnipiac.